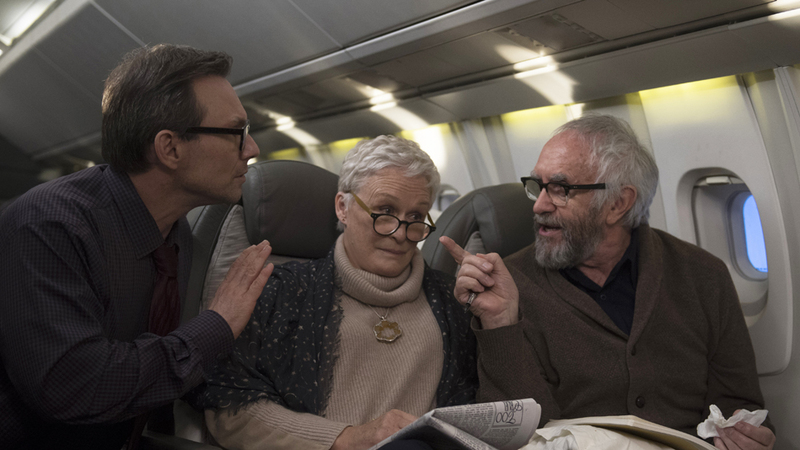 Powered by Glenn Close’s riveting performance, “The Wife” is nothing short of breathtaking. Intense, complicated, and indelibly authentic, Close’s work brings to life the character study at the film’s heart with profound feeling and expression. Her work here alone makes the film worth seeing. Add to it stellar work from co-star Jonathan Pryce (“Woman in Gold“) and sure-handed direction from Swedish filmmaker Björn Runge and you get one of the year’s must-see films for cinephiles. Close plays Joan Castleman, wife of celebrated author Joe Castleman (Pryce) for nearly forty years. The two are a study in opposites. Joe can be loud and narcissistic, while Joan always maintains her calm and collected demeanor. Joe relishes the spotlight, while Joan seems happy in his shadow. When Joe receives word he’s to receive the Nobel Prize for Literature, it seems the perfect validation not only of Joe’s talent, but of all their hard work together. But the trip to Stockholm to receive the award reveals cracks in the couple’s veneer of perfect partnership. Beneath Joan’s self-effacing grace something simmers, and the stress of the trip threatens to make it boil over. The persistent pestering of a would-be biographer for Joe (Christian Slater) and difficulties with their son David (Max Irons) only add to the strains. Just what it is, though, that’s pushing Joan to her breaking point? The answer lies in pivotal moments in her shared past with Joe, moments she reflects on during the trip. It’s those moments, now revisited in the context of Joe’s ultimate moment of glory, that lead her to question every choice she’s made along the way. Has their life together been happy? Yes, at times. But could it have been something more? Could she have been more than just “the wife”? Screenwriter Jane Anderson‘s script for “The Wife” is a study in slow-building tension. Adapted from the 2003 Meg Wolitzer novel of the same name, it focuses on the emotional roller coaster Joan experiences while at Joe’s side. Anderson utilizes flashbacks for a number of the film’s dramatic beats. Thankfully, she keeps her touch light with these — they never threaten to derail the film’s rhythm or momentum. Anderson intertwines into her narrative surrounding the Castlemans some interesting commentary on the act of writing, itself. In particular, there are observations about the motivation to write, the toll it takes on private lives and relationships, and barriers encountered by female writers that may prove fascinating to certain audiences. The additional complications added to the film’s personal drama by those issues just add more richness to “The Wife.” They help define the film’s central relationship in a memorable and provocative way. As the titular character, Close naturally gets the lion’s share of screen time in “The Wife.” What she does with that screen time should stand out, even from a career so full of standout work. What’s so compelling here is how she depicts the slow erosion of her character’s stoicism. The range of expression Close delivers as Joan battles with her emotions and her rising indignation should be a study in how to deliver credible, visceral rage. Pryce, meanwhile, provides a foil to Close’s character that’s contemptible without at all being cartoonish. What’s key is that as unlikable as Joe can be, Pryce still makes it clear that he loves his wife and the life they’ve built together. He’s not a villain — he’s just hopelessly, unforgivably flawed. Runge, meanwhile, generally stays out of the way of his performers, allowing their work to carry the film. Like Anderson’s no-bombast approach to the source, there’s nothing gimmicky in Runge’s approach to visual storytelling here. Instead, the film seems to exude his faith in his cast’s ability to find the characters’ voices. That faith, as it turns out, is well rewarded. 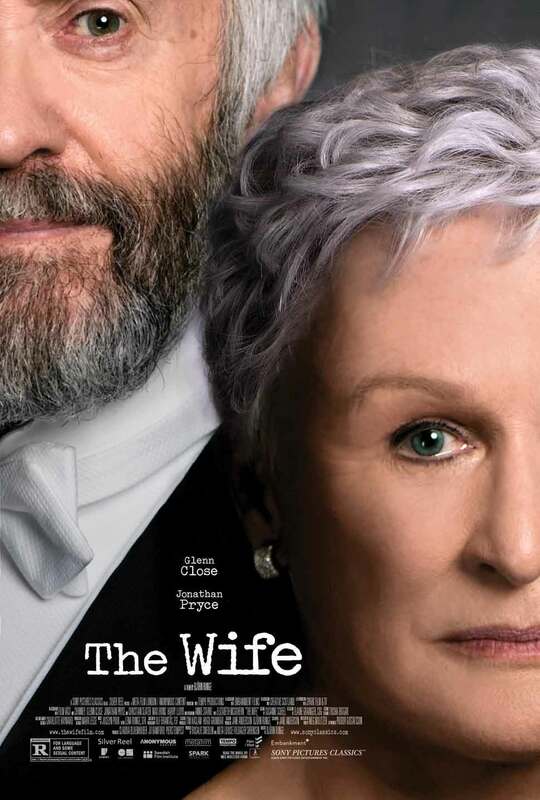 Like most films distributed by Sony Classics Pictures, “The Wife” started its theatrical run in only a handful of theaters. It arrives in Florida markets this weekend. Should you be fortunate enough to have one such theater nearby this weekend, don’t hesitate. Buy a ticket for this one. Especially for audiences who love intimate but vibrant character dramas, this is what it’s all about when it comes to good movies. The Oscar buzz for Glenn Close’s work here has already started buzzing. See for yourself — the buzz is entirely deserved. Starring Glenn Close, Jonathan Pryce, Christian Slater, Max Irons, Harry Lloyd, Annie Starke, and Elizabeth McGovern. Directed by Björn Runge.